Instagram has announced that the capacity to share regular, public Instagram posts to Instagram Stories is now being rolled out to all users. The process is fairly simple – when you see a post you want to share in your Story, you tap the airplane button below the post and you’ll see a new option to “Create a story with this post” (middle image above). Select it, and you’ll be able to use the post as a sticker, with a customized background ready to share. You can rotate, scale and move the post sticker as you wish – and as you can see, the original poster’s details will be included with the re-used post. The functionality was first seen in testing back in February, and as we said at the time, it’s an interesting, though not overly ground-breaking option. As noted by TechCrunch, many people have been sharing screenshots of posts anyway, so formalizing the process with an official option doesn’t add a heap functionally, but it does provide another way for users to create Stories content, and generate engagement around Instagram posts. 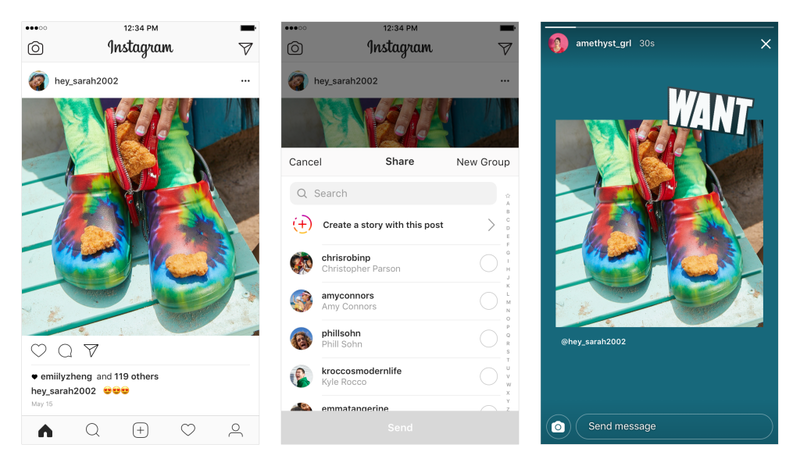 Instagram’s testing a heap of new Stories options, with many spotted by Instagram code sleuth Jane Wong who uses a method of cross-checking code updates to spot new tests. Going at the rate at which this feature went from test discovery to roll-out, you can expect to see a lot of these coming in the next month or so – if, of course, Instagram decides to push ahead with them. For now though, we have a new Instagram feature to play with. It’s not the much requested ‘re-gram’ feature users have been calling for, but it’s pretty close, and it could have a range of benefits to help promote brand content. In addition to this, Facebook is also rolling out the ability to turn existing, organic Instagram posts into ads within Power Editor and Ads Manager. It’s not available to all users as yet, and the option is limited to single photo and video posts (for now at least), but it’s another Instagram ad option to consider.